We emphasize moving people, not vehicles, and being there, not getting there. 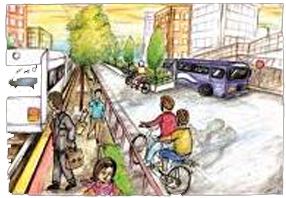 The foundations of a healthy transportation system are communities where people feel safe and comfortable walking. Every trip begins and ends on foot (or wheelchair). The more inviting the environment, the farther people are willing to walk. We envision safe sidewalks, visible crosswalks, and protected bike lanes everywhere. Going by foot or bike will be simple for all kinds of short trips. We envision secure bicycle parking at shops, transit, schools, workplaces, etc. We envision a time when cars and buses no longer have tailpipes. No more exhaust fumes! No more pumping endless amounts of oil from the ground, only to explode it in car engines and vent it into the air. Driving an internal combustion engine vehicle will be as unacceptable as smoking in a restaurant or a theater and as out of date as a horse and buggy. Electric-assist bicycles will provide a wider segment of the population the option to go longer distances. We can take a walk or ride a shared bike to go shopping, and come back in an electric vehicle with what we bought (unless it’s a big appliance we’ll have delivered by electric light truck). Electricity will power trucks, trains, and ships as well as cars and buses. 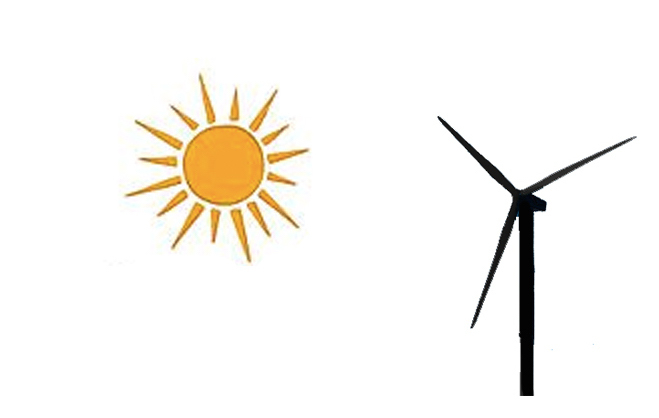 Cities and counties in the Bay Area will have electric power made from 100% clean energy sources like wind and sun. Many will have community-choice energy programs that let citizens choose the source and bring the generation jobs here. People regularly use public transit, which is frequent, reliable and convenient. Trunk lines run at regular frequent intervals fed by on-demand public and private systems. We envision living near where we need to go as much as possible. No more three-hour commutes! Houses and apartments should be located near employers, schools, hospitals and shopping areas. All new development will be located with a convenient walk to frequent transit. Many homes now can be reached only by automobile. Not building more of them will eliminate a major source of increased GHGs as the population grows, and keep congestion from getting worse. We envision fewer solo trips and fewer vehicles. No more sitting in traffic jams! Shared rides whisk us from home to wherever we need or want to go and back on highways with fewer cars. More of that electric power can go to other uses. Less and less of our time will be taken up with getting the car fixed and cleaned and worrying about a place to park. With more shared ridership, valuable street space can be better utilized for other purposes, whether it be more housing, protected bike lanes, wider sidewalks or green spaces. Vehicles are getting smarter and safer. Self-driving cars are likely to be prevalent on the streets within 10-15 years. These innovations offer opportunities for safer, less stressful travel. But they could also turn into even worse traffic congestion unless properly aligned with public transit. Self-driving technology is best utilized with shared rides and car sharing rather than individual ownership. They provide a wonderful opportunity for offering the first and last mile of on-demand service to fixed public transit at a fraction of the cost. We envision a lot more trains and fewer trucks. Heavy goods move between our towns and cities by rail. Electric vehicles shuttle them from the depot to where they’ll be sold or used. Delivery trucks within cities are all electric. Even longer range trucks and buses can become electric powered as technology advances. We envision lots of high-quality, living wage employment in transportation. Skilled jobs will include using high-tech communications to make all the rides available when and where we need them, and using high tech to set up and maintain convenient ways to pay for the use of roadways, public transit, and parking spaces. Other jobs will include handling and fixing the vehicles, constructing new buses, new rail lines and stations, and keeping travel safe. Because some drivers’ jobs will be lost to automated vehicles, we support a just transition. We envision job training and placement of former drivers. Private innovation is welcome as part of the transportation system. With proper regulation and coordination, entrepreneurs can join in the transportation revolutions in electrification, automation, and ride sharing as long as they offer quality service that doesn’t undercut public transportation systems. We envision a seamless transportation system with easy, reliable connections through a coordinated regional system. The most cost effective means of achieving this is to consolidate transit systems even to the point of creating one regional transportation system. To ensure accountability and transparency it would have an elected board with representation from each of the 9 Bay Area Counties. Consolidation would avoid duplication and guarantee connectivity and universal access. Even the least populated areas would have some sort of transit option and the urban areas would not be clogged with suburban generated traffic.